I’m very pleased to let you all know that we have been having a lot of fun this month in the Kinder and there is much more fun to come! This month we have been looking at shapes in the Kindergarten! We have been learning all about shapes, how to recognise a shape and how to make them too!. We have also done two projects this month, our first project was about Autumn. In chinese: 秋天(qiū tiān). We looked at Autumn leaves that some of the children had brought in to show the class, we painted and played with the leaves and we also looked at Autumn colours. The children had a lot of fun, especially whilst painting with the leaves! 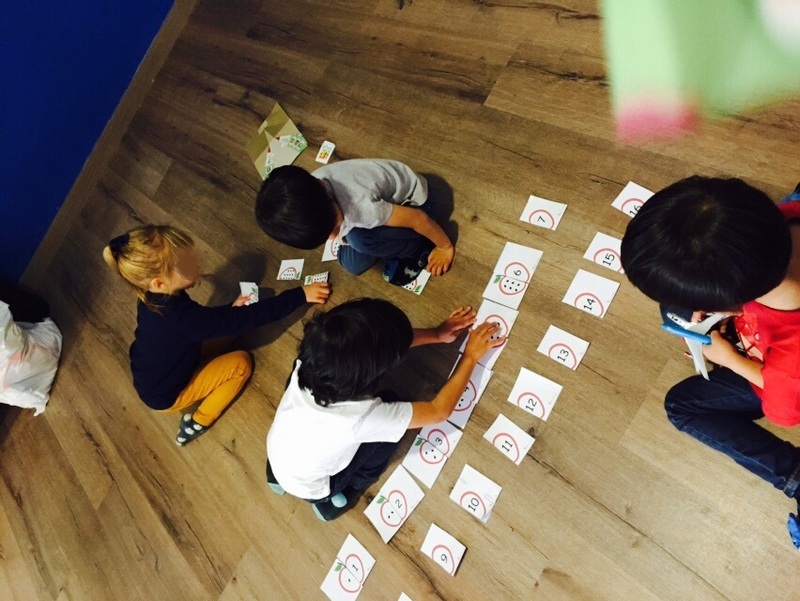 Our older children in the kinder (4 years old) have been introduced to sight words in English and chinese. 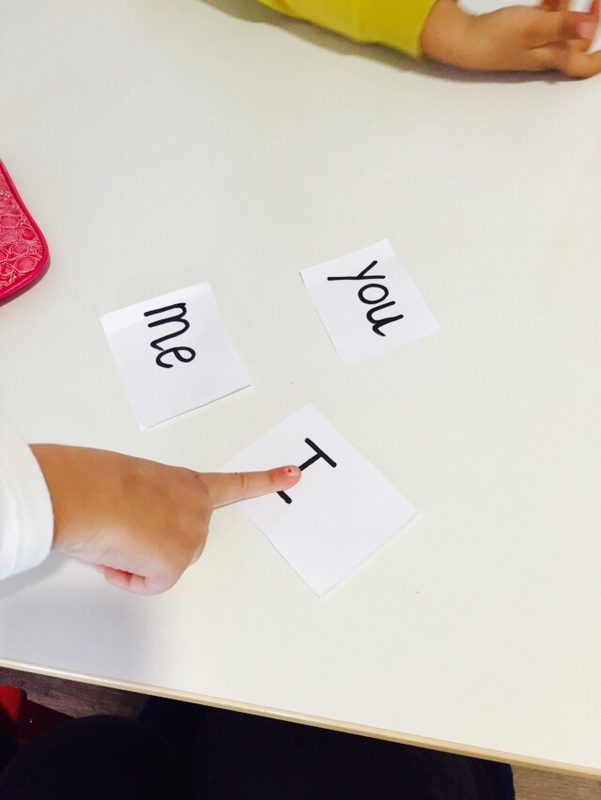 They are learning to recognise the most frequent words in a natural and fun way, in order to facilitate reading in the future. This month we have been working on the words: I, Me, You and the numbers, One, Two, Three, Four and Five. We have been working in chinese: 人rén (person),口koǔ (mouth), 手shoǔ (hand, 三sān (three), 四sì (four)，五wǔ (five)、六liù (six), 七qī (seven), and 八bā (eight) and also doing maths. We have continued with the phonics this month in the Kinder and the children are recognising them well. The two year old group have learned the phonics from Aa-Dd so far and the older group have worked with more, from Aa-Ff as well as the letter T and S, we have also introduced the letter R this month, but we shall be focusing on it more next month. December is a very exciting month in the International Kids Center! We have lots of fun things to learn about. The theme for the month of December is ‘Around the world with Santa!’. We are going to be looking at how Santa Claus flies around the world and learning about many of the interesting places that he stops at! We would like to ask all of the children to bring us a picture of themselves in another country or the country that they are from (the more, the better!) to help us talk about all these wonderful places around the world. Within this theme, we will continue learning our phonics with ‘Jolly Phonics’ and the older children will carry on learning some more of the sight words in English. We are also focusing a lot of maths and logical thinking with both groups of children. 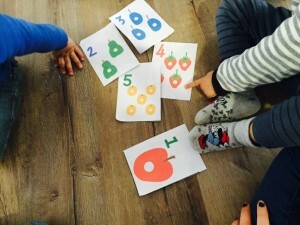 We are encouraging them to count, add and subtract, as well as, sorting objects into colours and shapes, through the use of game and fun activities to help stimulate logical thinking in a natural way.